Cherry tomatoes were developed in Israel. Pick up a statue of Liberty along Akko's waterfront. 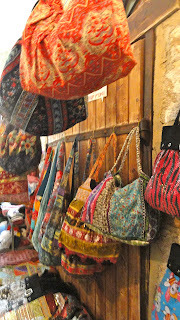 Israel will surprise you, please you, feed you fabulously, frustrate you and stay with you long after you return home. Israel can be a challenge for Levelers because not much of it is. Civilization has been walking and warring on it for far too long for it to be level. A lot of what you want to see is high up or way down. Another challenge, you will be going from hundreds of feet below sea level to thousands of feet above it so bring your sinus medication. 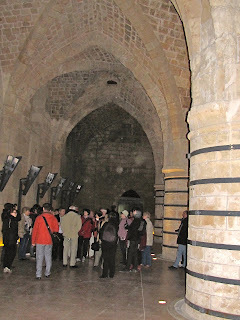 I began with a tour of Classic Galilee organized by the Israeli Ministry of Tourism which was hosting the Freelance Council of the Society of American Travel Writers. They wanted to show us everything and we were anxious to see it, but not enough time had been allotted. Tip: Don't expect to do it all in two weeks. You can't. 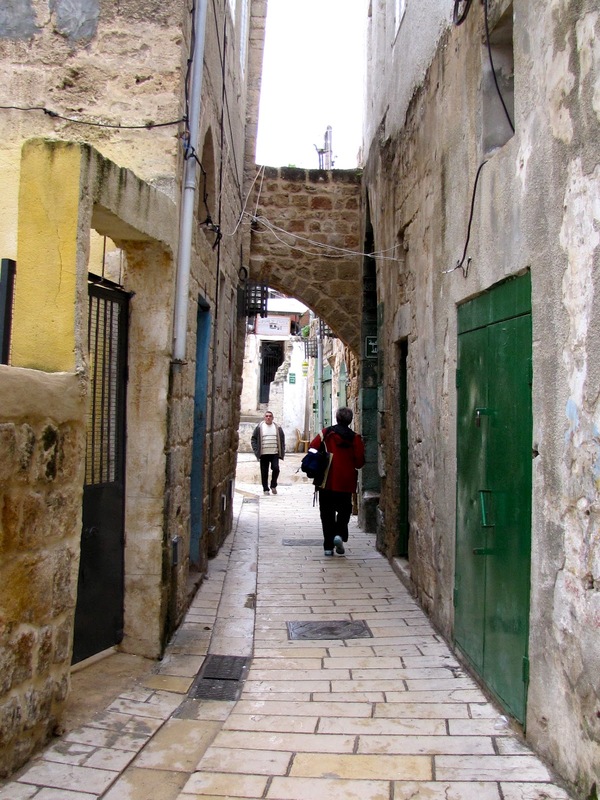 Israel may be a tiny strip on the map, but there is a lot to see. Our guides were just as frustrated as we were. If there is a particular site/sight you care about, ask how much time will be spent there before signing on to a tour. Downtown Haifa from The Colony Hotel. 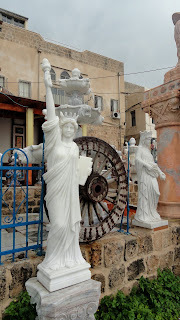 I was looking forward to seeing Haifa, a truly international city of yellow stone, but by the time we arrived it was dark and rainy and when we left the next morning it was gray and rainy so all I saw - and it was temptingly beautiful - was from a bus window. Tip: Possibly just as well because Haifa rises sharply from the Mediterranean Sea and the prettiest parts are high up on steep slants. Despite that, I would like to have spent time in the terraced gardens of the Baha'i Shrine, a UNESCO World Heritage Site. From bottom to top of those gardens, there are 1,800 steps! Haifa from above. The golden dome at left is the Baha'i Shrine. This center of the Baha'i faith seems to encompass all major religions in harmony and certainly warrants another, longer visit. 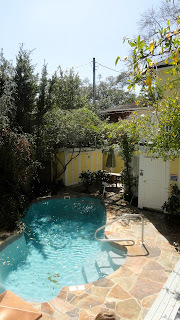 We stayed at The Colony Hotel which I can highly recommend. There's a elevator to your right from street level to the lobby and another inside. These streets of Akko/Acre have seen a lot of walking. 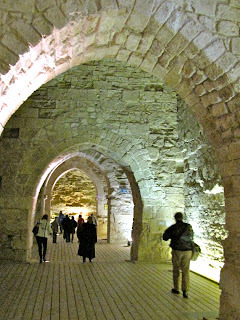 Akko, across the curving edge of the Mediterranean is worth a whole day; we had a few hours. People have lived here since the Phoenician era, more than 4,000 years ago, making it one of the world's oldest continuously inhabited city. 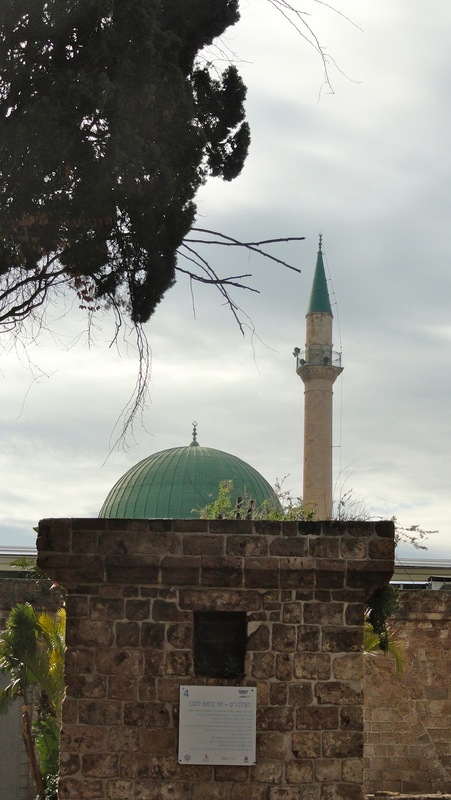 Julius Caesar was here, Paul of Tarsus walked its streets, Baha Ullah, founder of the Baha'i faith, died here. The city paid tribute to Pharaoh Thutmose III in the 16th century B.C. Persians took it from the Israelis, Alexander the Great took it from them, Ptolemy II of Egypt inherited it but the Muslims took it from his heirs. Then came the Crusaders in 1104 A.D. They took it, Saladin retook it and Richard III took it back. Napoleon was about the only general of note who failed to capture it. 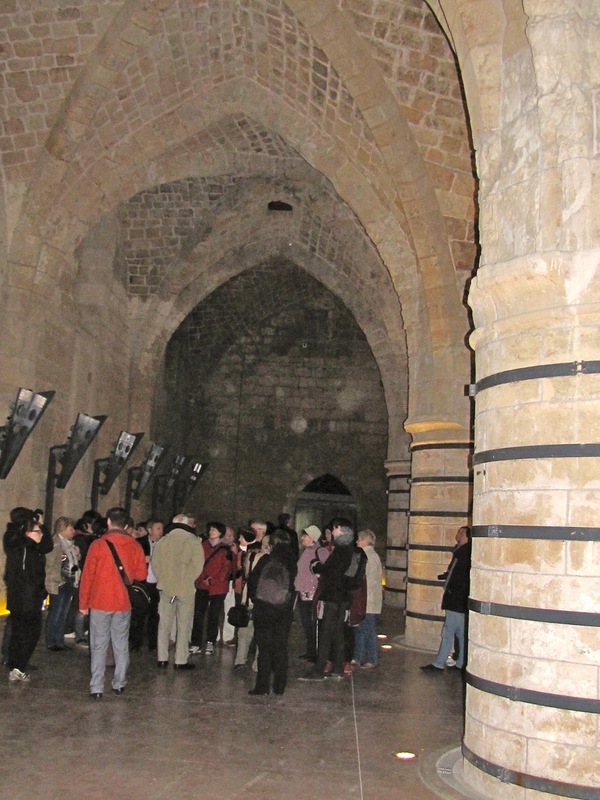 Tourists are drawn by what the Crusaders built 900 years ago, which is still being discovered and uncovered. Archaeologists wondered for years where the steps went. 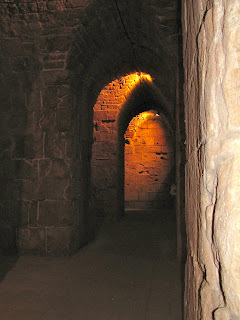 a vast knight's hall, now underground, and a large underground tunnel leading from the hall to the battlements and port. There are churches and mosques of note as well as another set of Baha'i gardens commemorating their founder. Savannah couldn't be the Hostess City of the South without a plethora of good restaurants because a Southern hostess always makes sure her guests have a beverage of choice and more good food than anyone could eat. Whatever you do, leave the diet at home. 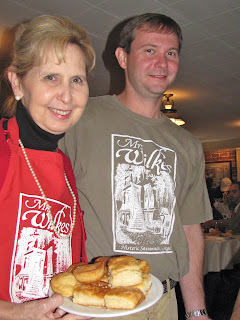 Mrs. Wilkes Dining Room is a Savannah experience everyone ought to have at least once. Morning newspapers have barely been delivered when folks start lining up. Doors open at 11 a.m. and diners keep pouring in, 75 at a time, for a spot at the communal, family-style tables for 10 until 2 p.m. or when the last person who was in line by then is seated. Price, cash only, $18; children 12 and under, $9. No reservations although exceptions have been made for presidents and a few fortunate others. The food - three meats (we had fried chicken, beef stew and barbecue) and a dozen vegetables, biscuits and cornbread, a choice of two desserts and tea - keeps coming as long as you're eating. When you're finished, please carry your plate to the kitchen; it's a tradition. Wilkes House no longer boards guests, but it is still a family affair: Mrs. Wilkes' granddaughter, Marcia, and her son, Roan, keep it moving and Marcia's husband, Ronnie, keeps tabs on the till. Leopold's Ice Cream is another Savannah tradition and "must." 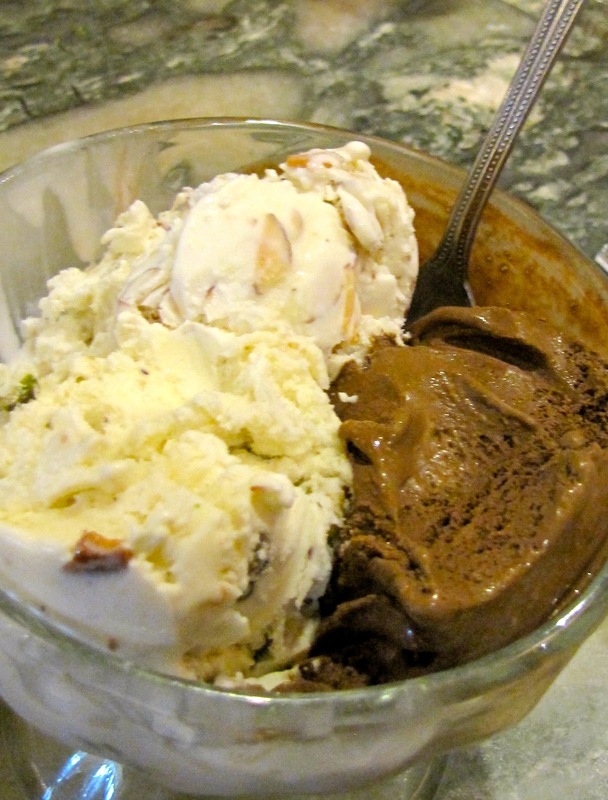 Founded in 1919 by three Greek brothers, it serves up the finest ice cream you are likely to find. Made fresh, one batch at a time, from secret family recipes, this is one treat worth the calories. Their chocolate is the best I've tasted since my father was in the ice cream business with the best production manager around who had his secret recipes. Everything here is made from scratch from bread, soup and salads to sandwich fillings and candy. Mary and Stratton Leopold, son of founder, Peter, run it today. Stratton scoops up a mean cone when he isn't producing movies. Yes, he's that Stratton Leopold, the one who produced Mission: Impossible III and The Wolfman among others. 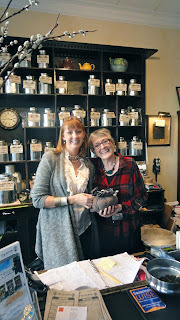 Tea Room owners Becky Wright and Elizabeth Ruby. 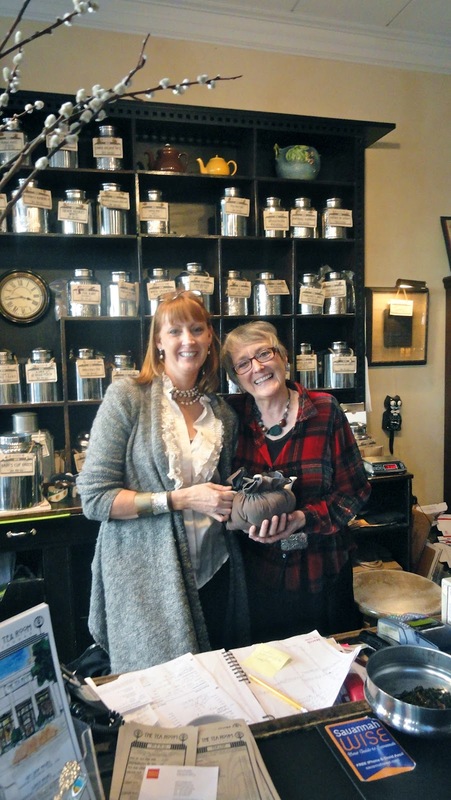 The Tea Room in downtown is owned by mother-daughter Elizabeth Ruby and Becky Wright, who designed it so their husbands would feel comfortable eating there. Actually, men love the library room and they won't feel like looking for the nearest burger joint after having lunch. A long way of saying the portions are generous. Delicious, too. You'll find as many locals as tourists here. These women know their tea, from buying to brewing, and have some you've probably never encountered. Emperor's Bride, for example; theirs is the only tea room in America where you can find it. Do not miss the Flaming Tea - Imperial Black Dragon, an oolong, is treated to a sugar cube flambeed in a brulee spoon. Alligator Soul is hot. Every local I encountered, when hearing I planned to dine there, sighed and said it was their favorite. Now I know why. Heaven on a plate for carnivores - they specialize in game, steaks and local seafood - it's also beloved by vegetarians, vegans and the gluten-free set. It was founded by Maureen Craig and her late chef husband, who had a rare but successful mixed marriage: he loved meat and she's a vegetarian. These Washington State restaurateurs relocated, bringing that Northwest sensitivity to freshness and flavor to what used to be an underground grain warehouse. You will want to linger at Alligator Soul. Chef Chris DiNello keeps that touch in the kitchen and Maureen makes sure everyone in the warm and cozy dining room is happy. "I like to bring people around a table," she said. "I want to entice people to stay around longer like we used to." Tell the waiter you're a vegetarian or have allergies and Chef Chris is likely to come out to confer; he loves adapting to challenging diets. 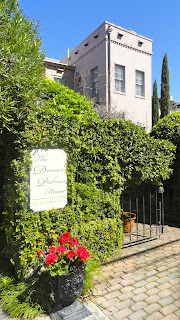 This is where Savannah gourmets go for that special meal. Tip: There are 17 steps from street level. Vic's on the River is in a five-story, circa 1859, former cotton warehouse slap dab in the middle of the Bay and River Street party district. All that and entertainment, too. Tip: The entrance on River Street leads to a coffee shop, the second floor is a gift shop. The kitchen, restrooms and a private dining room are on the third floor. The main Bay Street entrance, bar and dining room are on the fourth floor. Fortunately for Levelers, there's an elevator that connects it all. A good thing: floors are 18 steps apart. "Sophisticates Southern" is the way I'd describe its decor and food. Exposed brick, a cool bar - a very good chanteuse sang the night I was there - and entrees that go from Mixed Grill to Meatloaf. The appetizers were my favorites, especially the new Crab and Avocado Tower. Chef Brian Hanson is an alumnus of the prestigious Ponte Vedra Inn and Club, the Sawgrass Beach Club (both in Florida) and The Lodge at Little St. Simons Island. Leoci's Trattoria is a small, owner/chef restaurant near Forsyth Park that you aren't likely to stop at unless someone tells you about it. Consider yourself told. After I checked into the Dresser Palmer House I asked if there were any good places for something light nearby. This was one. Wish I'd been hungrier. I ordered a grilled vegetable panini, planning to eat only the vegetables. So much for good intentions; not a morsel remained. Excellent veggies, delicious balsamic flavor, extraordinary bread. Just too good to leave. James Oglethorpe, founder of Savannah. • Walk in George Washington's footsteps (the bed and house he slept in is long gone). Or General W. T. Sherman's. 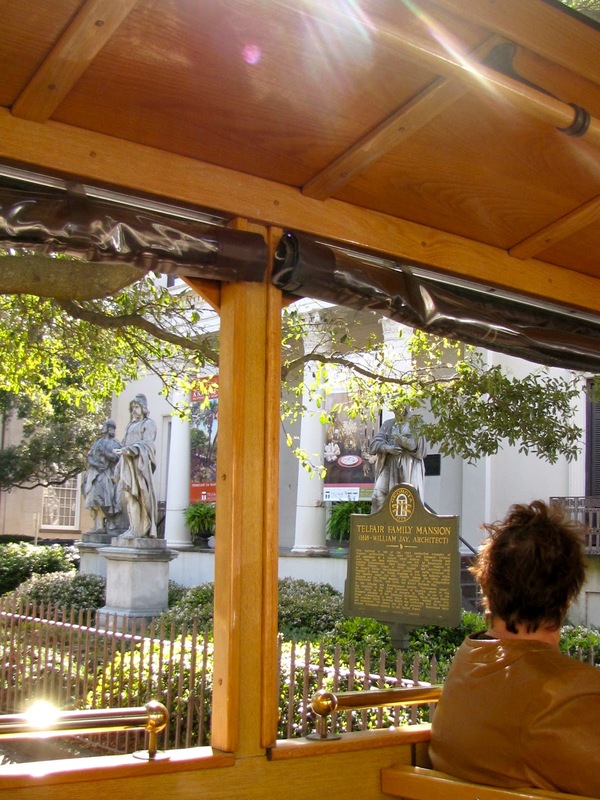 • Sit on city founder General James Oglethorpe's bench - or Forrest Gump's. 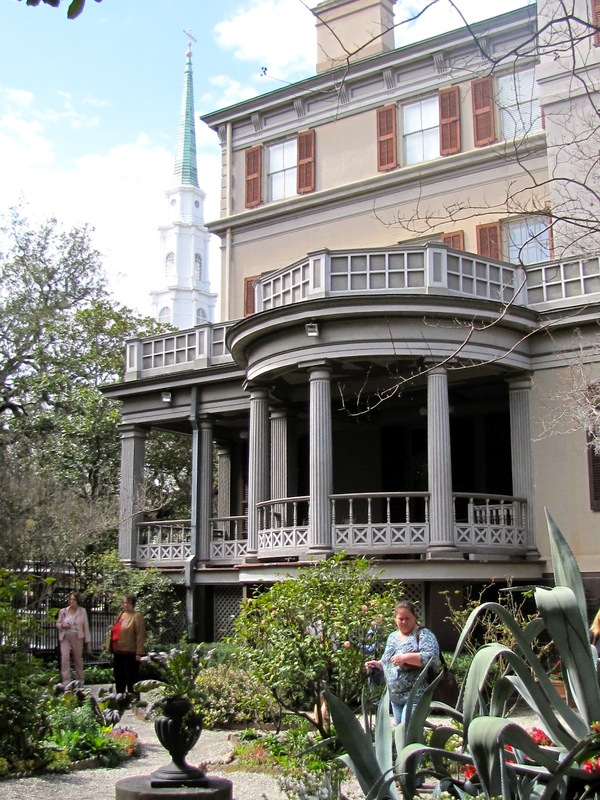 • Visit significant locales in "The Book," Midnight in the Garden of Good and Evil. • See where the ghosts linger (pretty much the whole city). Madison Square and statue of Revolutionary War hero Sgt. William Jasper. • Survey the squares - the original four grew to 24; 22 remain. • Visit significant wartime sites from the American Revolution on. 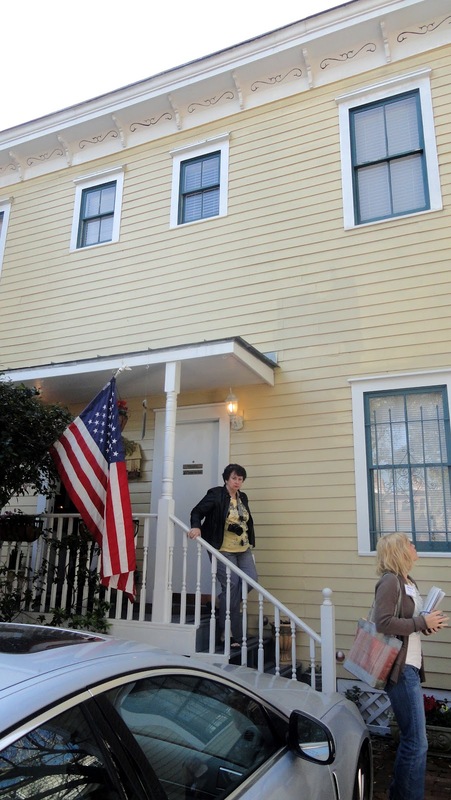 • Celebrate the 100th anniversary of the Girl Scouts with a tour of Juliette Gordon Low's birthplace and the outbuilding where the first troop had its first meeting. 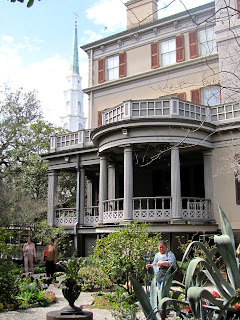 Savannah is one historical landmark, anecdote or cause celebre after another, but what you will remember is the architecture, flora and ambiance of one of America's prettiest cities. Tip: My advice for anyone and especially Levelers: Get thee a map and a window seat on a trolley tour. There are several from which to choose. I was hosted by Old Savannah Tours and found their guides to be extremely well informed, accurate and entertaining. 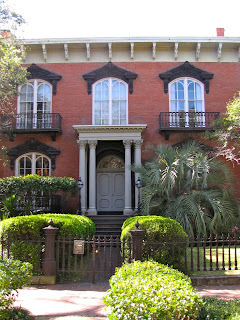 Passing the Telfair Family Mansion. As you're driven about the city, circle on the map those spots you want to see more closely. Plot your walking tour from there if you're up to it or sign on for another tour with hop on, hop off privileges. Tour Tip Two: Start your hop on-off tour early in the morning. Trolleys on the last circuit of the day fill up fast. Ask your driver when his last circuit runs and try to catch it early. That way he or she will deliver you to your hotel or inn. 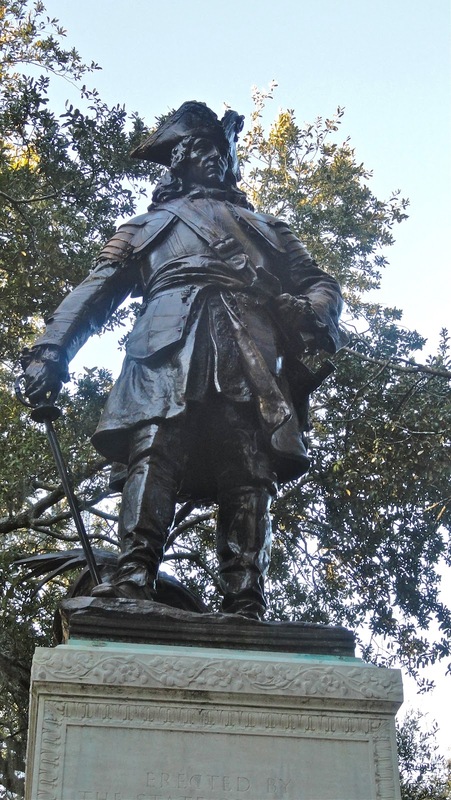 Tour Tip Three: If you're up for a walking tour (Savannah's mostly flat, remember), Sellers & Higgins (Phillip and Tony) do a Lechery, Treachery, Debauchery tour that gets rave reviews. Hard-Hearted Hannah, the vamp of Savannah of song fame was real, by the way. Pirate House, originally the Herb House, circa 1734, is considered the oldest surviving home in Georgia. Visitors invariably wander River Street but it's too touristy for my tastes. Bay Street, which goes along the bluff above, is nicer. The Pirate House is another touristy stop but it's a fun one with some genuine history to it. Robert Louis Stevenson was supposed to have been inspired to write Treasure Island while staying here. Next door, the restaurant of the same name is also touristy but fun. Here are some things you might not think of that I found worthwhile. 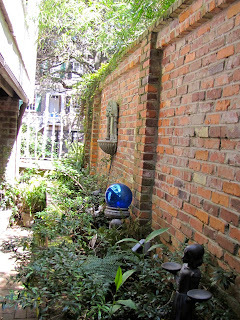 Juliette Gordon Low house from the garden. 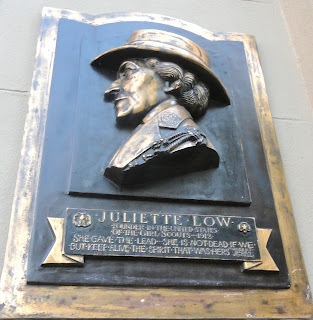 Juliette Gordon Low Birthplace. Yes, it's on all of the lists but she was a remarkable woman, an accomplished artist and much ahead of her time. Worth it to learn more about her life and this from one who flunked Brownies and Girl Scouts. Tip: There are stairs but also an elevator. 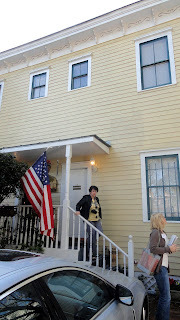 The Flannery O'Connor Childhood Home. What's not to love about a girl who declared herself an adult before she was old enough for school and taught a pet chicken to walk backwards? One of America's finest short story writers was also one heck of a character. The house itself isn't much - her father was not good at making money - but the stories and anecdotes told by guide Toby Aldrich are worth the time and the steps you have to climb - 12 steps up to the entrance, 17 steps to the second level. 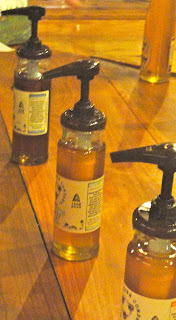 Savannah Bee Company. 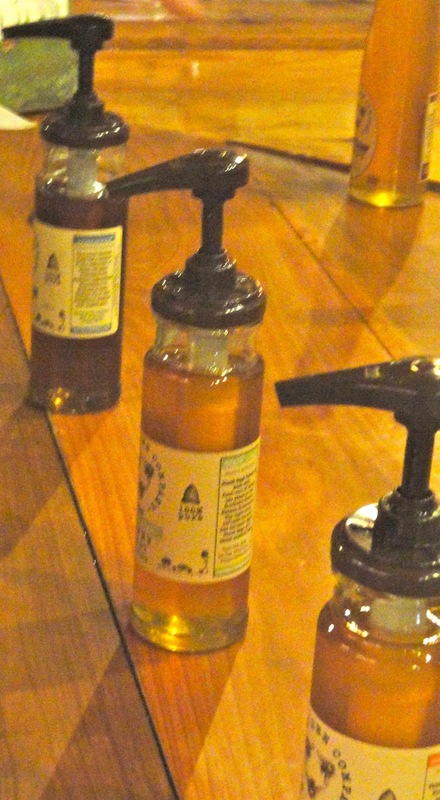 No, it's not a museum or historical site but you will get an education on the remarkable honeybee. Owner and founder Ted Dennard is just as anxious to share his love for the amazing creatures as he is to sell you a product. From encaustics, paintings made with beeswax, to tastings of different kinds of honey, it's definitely out of the ordinary. Music in the Parlour with Diana. The latest in Savannah's long history of fascinating chanteuses, Diana Rogers brings a classical background to her piano and song stylings as well as wild costumery and fun. 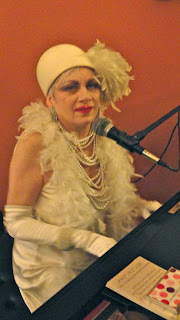 Each Sunday she welcomes "guests" - it's $30 - into her Victorian home for tea, champagne, scones and two hours - 1-3 p.m. or 4-6 p.m. - of memorable songs. 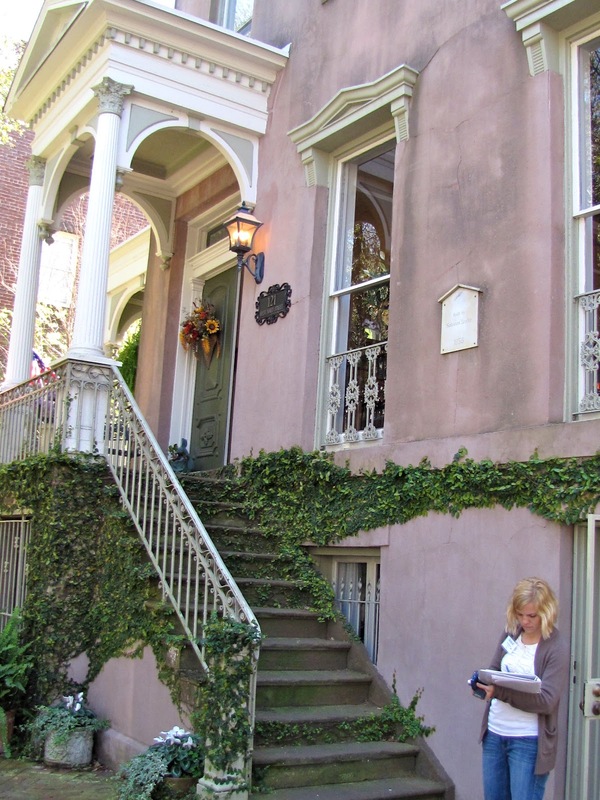 The Savannah Tour Guidebook ( $8.95) is a good, short resource for tours and tidbits of the city. Savannah, GA, is a gem with unique cuisine, beautiful scenery and a fascinating history. Savannah is a charmer, a Southern belle from her brick pavers to the curlicues of moss that swing flirtatiously from her gracious oaks. She calls herself the Hostess City of the South and with good reason. Residents greet visitors with smiles and genuine Can I help you's. Tip: Best news of all for Levelers, she's flat. Not such good news, it took a long time to pave all of the streets so historic buildings and houses were built with entrances and living rooms on the second level to avoid the dust and to better catch cooling breezes. Like any tourist-popular city, she has attracted hotel chains, major and minor, many of which are conveniently located. Professional hostesses of Savannah, (from left) Shannon Romine, Dresser Palmer House; Theresa Jacobson, Azalea inn and Gardens; Savannah Mayor Edna Jackson, Jackie Heinz, Zeigler House; and Diane McCray, Green Palm Inn. But when you visit a city known for its charm, why not put yourself in the hands of a professional hostess? Not that kind - this isn't Lady Chablis writing, you know. I'm talking about the kind of hostess your mother would have admired, one who assembles striking, comfortable spaces, serves outstanding meals and sees to her guests every comfort. 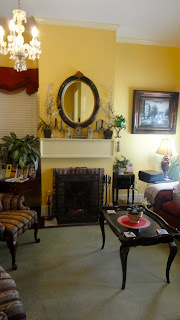 Recently I was invited to "try on" the four inns of www.Savannahinns.com. Here are my impressions. Rock coffee or cocktails on Savannah's longest gallery. Enter from the front and the longest gallery (that's front porch to non-Southerners) in town greets you first. Park and enter from the back and you pass through wrought iron gates to a gracious, wisteria-topped patio with an elevator (!) to the porch if you'd rather not do the stairs, although they aren't bad. Either way, innkeeper Shannon Romine is there to welcome you. Elevator is on the right. The 16 rooms are large, high-ceilinged and comfortably furnished; the bathrooms are modern and the bedding is luxurious. Tip: This may be the only historic B & B with an ADA-approved room (it's in the back) and there is a large front bedroom suite at porch level. The front parlor includes a Steinway grand piano and the "back room" features a handsome bar. Honor system if a bartender isn't on hand and guests are welcome to raid the kitchen refrigerator for cold drinks. Wine and hors d'oeuvres fill the dining room table in the afternoon and at breakfast, swell, prepare yourself for a delicious start to the day. If you hear strange noises at night, it might be little Madeline, the playful ghost child. Tip: Step count - six steps at front entrance, seven steps sidewalk to back entrance main level, 18 steps to the second floor. Green Palm Inn, where sailors once roamed. With only four rooms, this is the smallest of the four inns, but its charm is big, thanks to innkeeper and owner Diane McCray. A former history teacher, she loves to tell you about her adopted city and to share stories of its highlights, lowlifes and secrets. She's also a superb cook. Originally a duplex built for two old seamen, it is closest to the river (four blocks) and sports eight fireplaces; the stately Sabal Palm suite has two. 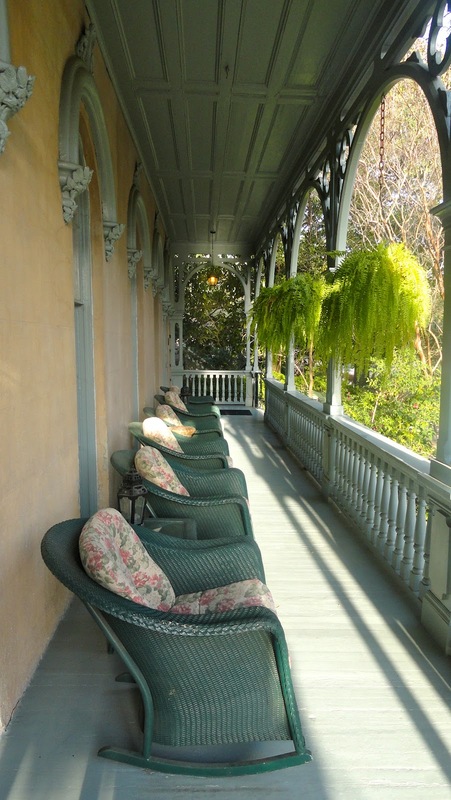 Fodor's described it as "a gem of an inn" and its small size belies the large suites within. Tip: Step count - five steps up from the parking level, six from sidewalk to front porch and 20 steps up to the second floor. Rock lively at the Azalea Inn. The brightly covered chairs on the small front gallery barely prepare you for the lively decor inside. Who knew Teddy Kennedy was with Oglethorpe when he met with the local Native Americans? 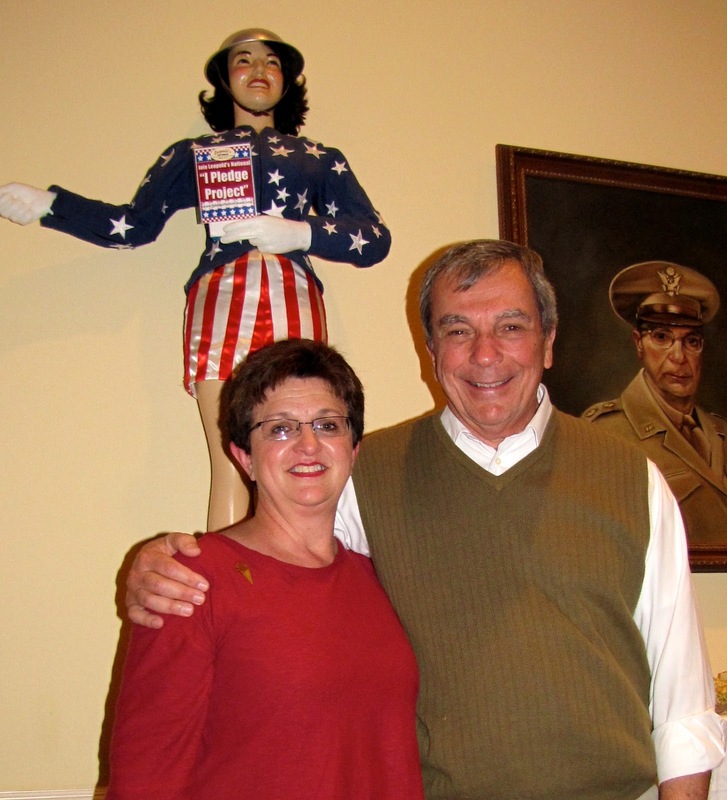 Innkeeper owner Theresa Jacobson turned the handsome home's dining room over to students from Savannah College of Art and Design (SCAD) and the result is a series of tongue-in-cheek murals portraying the city's history. Guests have a ball spotting the faces of Teddy Kennedy, Obi Wan Kenobi and a host of other notables. One of guests' many temptations. That is if they can tear themselves away from the food. Theresa cooks up a storm and there are always goodies out for the tasting. Watch where you step because Joey, a diminutive Yorkie, will be underfoot, hoping for a handout or dropped crumbs. Behind the house is - surprise - a pool, the only one at a Savannah B and B that goes above your knees, and a two-story cottage, one bedroom suites with kitchenettes on both levels. Tip: Step count - 12 steps from sidewalk to house, 19 steps to the second floor, six steps to the pool level. Street cred comes with Zeigler House. You've heard of keeping up with the Joneses? Jones Street may be where the expression began: it was the first paved street in the city to be paved because the residents paid for it themselves. 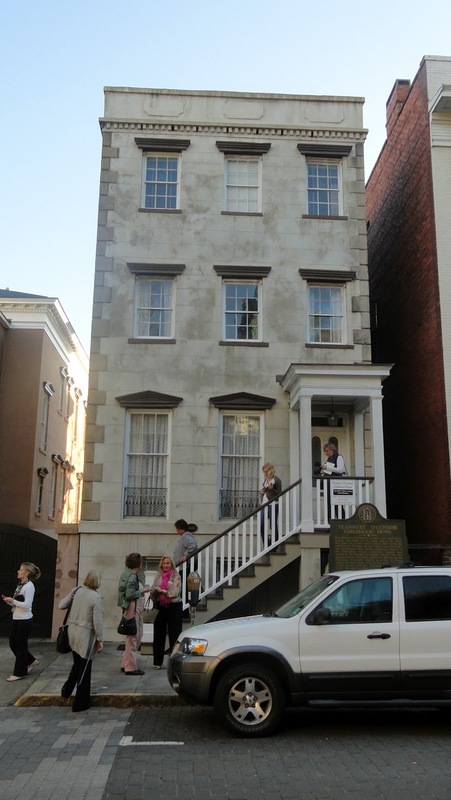 The Zeigler House is on Jones Street, just around the corner from the famous Mrs. Wilkes' Dining Room, some good shopping and several of the city's prettiest squares. In its past, the structure has been a boarding house and a bordello. "My ghosts are very friendly," quips owner innkeeper Jackie Heinz. Fruit, juices and baked goods are delivered to your suite each morning. Jackie, a former Atlanta caterer so you know the food's good, has created a unique experience. Each of the seven suites includes a kitchenette stocked with fruit, baked goods, juices and other beverages. 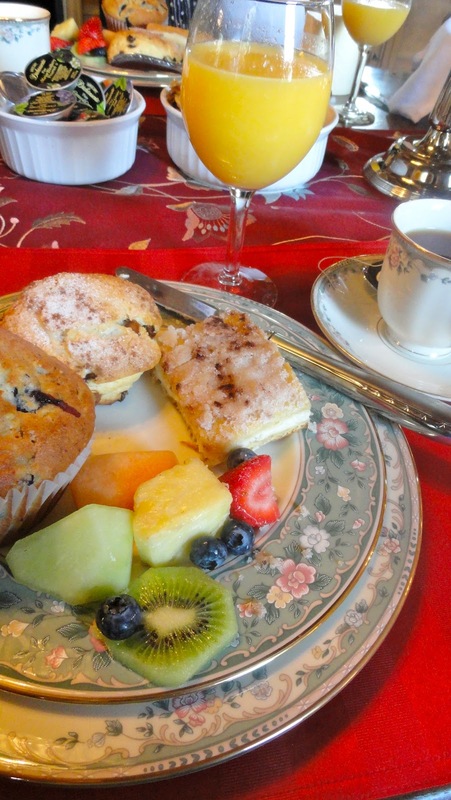 Each day breakfast, including freshly baked treats, is delivered which means you can come and go at your own schedule and need not join a sit-down meal. Suite with private outside entrance. 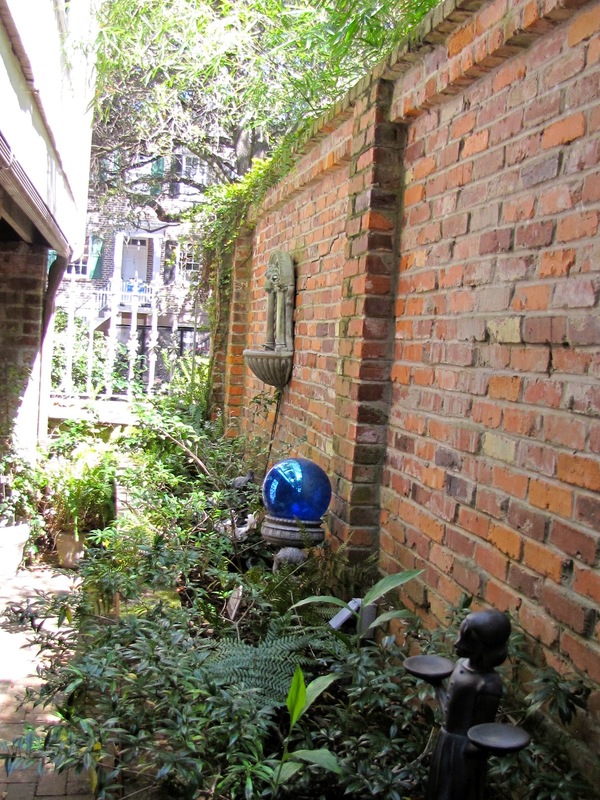 There are three first level suites with private gardens, one with a sidewalk level entrance, all of which means men really enjoy staying here. Tip: Step Count: 12 steps up to house. with each Savannah post here.